A hybrid isn't just for the worthy, says Sathnam Sanghera, this one's elegant, smooth and better than the petrol model. If people were asked to name, in the form of a Family Fortunes survey, the smoothest things known to man, the top 10 responses would doubtless include, alongside Sean Connery and the music of Sade: (a) an electric engine; (b) air suspension; and (c) a Mercedes automatic gearbox. The amazing thing about this car is that it features all three. And such is its utter elegance as a consequence that you can pull out of your drive on a Monday morning making less noise than a cat. And then, as you set off down the A41, you will experience a ride so comfortable that you may as well still be in bed, lounging across a set of Hungarian White Goose Down Pillows. If it were any smoother, it would be flogging you a timeshare in Spain while sleeping with your wife behind your back. The only note of inelegance comes in the form of a diesel engine, rather than petrol one, which kicks in when the battery runs out. But the advantage of this is almost supernatural fuel economy. I drove it for more than 350 miles and did not even have to think about refuelling. This was, of course, partly a consequence of the large fuel tank, which came as one of the extras that took my test model up to a price of £49,650. But it was mainly the result of a miraculous hybrid system. And that is the thing about this car. 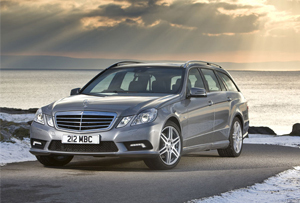 Estates do not usually get me excited: they are the bread and butter of the business car market. Hybrid cars, meanwhile, invariably have an effect that's the opposite of Viagra. But this hybrid estate is properly thrilling. It has everything you would expect from a Mercedes: performance and sharp handling, swish technology such 'attention assist', which monitors steering behaviour and can help alert to long-journey fatigue, and good looks. But it combines it all with the kind of abstemiousness you would normally only see in a Buddhist monk. Until now, buying a hybrid was something people forced themselves to do - like eating vegetables - because it was a good thing to do for the environment and their personal finances. But this car is the first hybrid I have driven that has more cachet than its fossil-fuel equivalent. Which makes it important, in an unpretentious, smooth way.